If you’re looking for year-round scenic views and endless outdoor activities, you’ve come to the right place! New Hampshire’s White Mountains is one of the most scenic destinations in New England. From a vibrant summer, glowing autumn, bright white winter to the rebirth of spring – there’s something for everyone in the White Mountains! 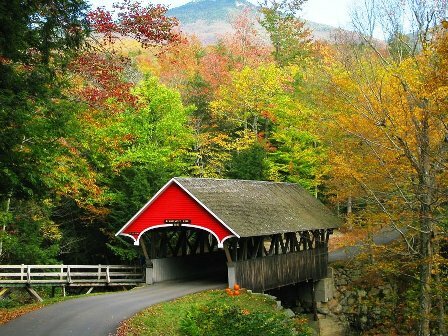 What could possibly be better than visiting the White Mountains….. how about living here seasonally or full-time. Due to the quality of life offered in this scenic paradise, families and individuals everywhere give up their lifestyles, career opportunities, friends, doctors and many other providers for the privilege of living in New Hampshire's White Mountains. This is no surprise since according to the 2018 KIDS COUNT Data Book published by the Annie E. Casey Foundation, New Hampshire ranks first in overall child well-being making it a great state to raise a family. And according to a 2018 US News and World Report, New Hampshire is ranked the 3rd safest state in the country; only out ranked by bordering states, Maine and Vermont. The state is home to the White Mountain National Forest which links the Maine and Vermont portions of the Appalachian Trail and is also home of the famous "4,000 Footers". 4,000 Footers refers to a group of 48 mountains in New Hampshire at least 4,000 feet above sea level. This spectacular mountain region is also offers 17 legendary attractions and natural wonders that will keep you entertained. A few local favorites are Clark's Trading Post, home of the famous Clark's Trained Bears and the Wolfman; New England's favorite waterpark, Whale's Tale Waterpark with the new Akua Beach where you can body-b oard; or a stunning natural wonder, The Flume Gorge, an 800 foot natural gorge in Franconia Notch State Park that includes a two mile loop of granite walls, waterfalls, covered bridges and glacial pools. New Hampshire’s White Mountains is a skiers dream; home to many ski areas including Waterville Valley, Loon Mountain and Cannon Mountain. Enjoy downhill and cross country skiing along with snowshoeing and tubing. This is a wonderful region to escape, kick back, explore and create unforgettable memories for many generations to come.